Color changing liquid is one of the most interesting magic tricks behind which lies the principle of science. This experiment demonstrates a clock reaction in the chemistry in which a clear liquid suddenly changes its color to dark blue. The time to turn a clear liquid into a dark blue color can be changed by changing the amount of substances inside the liquid. You have to go to a pharmacy store for a few materials, but other materials can easily be found in your kitchen. Precautions: Before you do any experiment, always wear your safety goggles, hand gloves, and safety apron. Also, perform the experiment in the presence of your parents or an adult. Place a tablet of vitamin C in a clear plastic bag and crush with the help of spoon until it becomes powdery. If you have mortar and pestle in your kitchen, you can also use it for crushing the tablet. Put the powdered vitamin C tablet into Glass A, then pour 60 ml (about 2 ounces) of warm water in it. Now, stir the liquid well to mix the powder well with the water – the liquid may become slightly cloudier. NOTE: You need to measure water accurately before pouring it in the glass. Take a spoonful (about 5ml of liquid from Glass A and pour it into Glass B. Then, pour 60 ml of hot water and one spoonful (about 5ml) of iodine tincture also in the Glass B. Stir the liquid in the Glass B well and you will watch the liquid carefully; the brown colored iodine tincture will become clear. Get the Glass C and pour in it 60 ml of hot water, 15 ml of hydrogen peroxide, and half spoon (2.5 ml) of liquid laundry starch. Stir the liquid in the Glass C well and keep it aside. Everything is now ready now, let’s start the fun part! 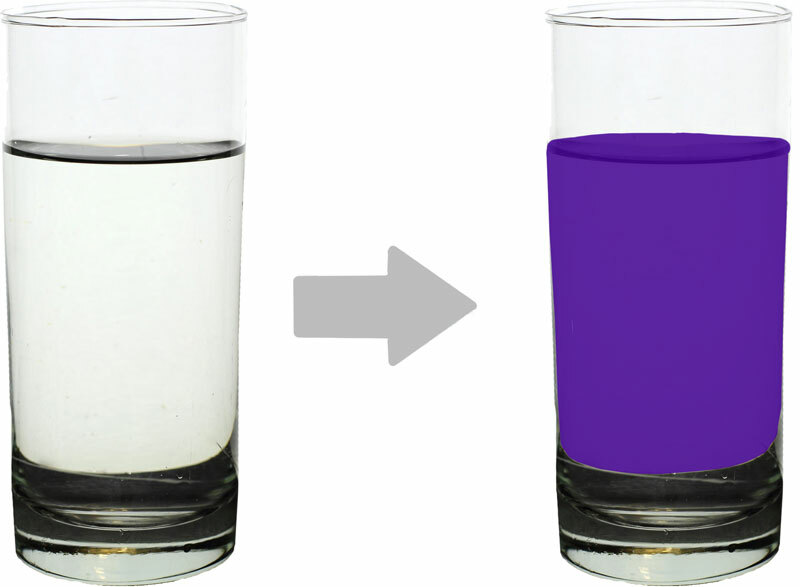 When you want to perform the experiment in front of your friends and family members, just pour all the liquid of the Glass B into the Glass C and mix the liquids well by pouring it between the two glasses about 3 times. Now place the well-mixed liquid in the glass and observe it carefully. It will suddenly turn into dark blue in a few minutes! You have just performed a chemistry experiment which uses the iodine clock reaction to turn the liquid color after a certain amount of time. The reason for adding “clock” in the name of reaction is because you can change the amount of time needed to change the color of the liquid (check below section more information). When liquid from Glass B, which contains vitamin C and Iodine, is added to Glass C the reaction begins. In this reaction, starch is trying to turn the iodine into dark blue color but vitamin C is preventing it from doing so. When starch takes over vitamin after a certain amount of time, the color of liquid suddenly changes and gives you a magical effect. Try to increase the amount of liquid that you pour from Glass A to B and see does it affect the timing of color changing. Try to use cold water in place of hot water and try to find out its effects on the reaction speed. Abdul Wahab, "Color Changing Liquid," in Science4Fun, April 12, 2019, http://science4fun.info/color-changing-liquid/.